I am honoured to be teaching Grade 8 Math and English this year at Holy Trinity. Technology (specifically coding!) is my passion and I cannot imagine teaching without the use of technology. Hands-on, minds-on learning is what drives my curriculum and teaching philosophy. Our classroom runs on engagement, positivity, and a little bit of chaos. (I was a social worker for many years!) and I'm so blessed to say I have the best "job" in the world. I am married to the coolest guy, commonly known as Mr. King, and we have one son, Noah who is in Grade 11. We have a very energetic beagle named Woodstock who makes our lives interesting every day! 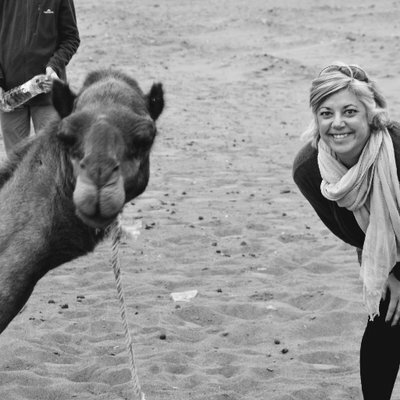 Our favourite thing to do as a family is to travel...ask me about our trip to Morocco where I made friends (not) with a camel or two! This website will be your "go-to" spot to learn more about what is happening in our class and at Holy Trinity. Be sure to check back regularly! Looking to join us on social media? Explore the "Home Share" tab above for a few options! In addition to student agendas, you will be able to see due dates, events, etc. on our "Agenda" and "Homeshare" tabs above. A great way to stay connected with your child's learning journey! Please do not hesitate to contact me at any time with questions or concerns. Simply scroll down to find my contact information. As parent myself, I understand the importance of home and school connections. ​Please do not hesitate to contact me at any time should you have questions or concerns.